Lantau Island extends a feeling that you are experiencing many things in one place - the flora or fauna, panoramic views in the mountains, soft sandy beaches, hiking tours or nature walks, variety of fresh seafood and a magical experience at Hong Kong Disneyland theme park. The unique blend attracts thousands of first-time travelers and regular travelers all-round the year. Lantau Island is a favorite MICE destination too. Companies looking for an off-site destination that positively impacts staff morale and productivity prefer Lantau Island. 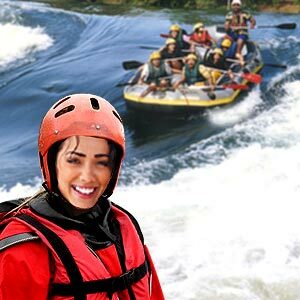 Gather information and decide if a weekend getaway is best or additional time is required to have a wholesome, relaxing and fascinating travel experience. The first destination would be Hong Kong International airport, Lantau Island is 34 km (21 miles) from central Hong Kong. From here, the options to explore the island include by sea or by road. Ferry service: Take the Ferry to Mui Wo, Lantau Island. The trip takes about an hour and leads through plenty of tiny little islands to Lantau Island. Fast ferry services take lesser time, around 35 minutes only. By taxi from Hong Kong, Airport: Lantau Island is adjacent to Hong Kong International Airport; the best way to Lantau from the airport is either by taxi, by bus, or by foot. There are frequent bus services from the Airport Terminal. For taxis, check at the reception desk at the airport and ask for light-blue car. Bus or taxi, it is interesting to observe life on Lantau Island through the window along the way. By cable car: Lantau Island is accessible through Ngong Ping 360 Sky rail - a cable car from Tung Chung. To commute within the island, tourists can hire a car, travel by bus or hire a boat or a bike. There is a lot to learn about an intended place of visit before actually stepping foot there. Lantau Island is in the southwest of Hong Kong. Lantau Island is the largest island in Hong Kong, located at the mouth of the river Pearl. Lantau Island is twice as big as Hong Kong Island but far less densely populated. Originally, the Island was a cluster of fishing villages. Hundreds of years back, the island served as a base for pirates and smugglers. Over 50% area of Lantau consists of national parks. Lantau has the longest suspension bridge carrying cars and trains in the world. Ngong Ping village on Lantau Island is a favorite destination for martial arts lovers. Free qixingquan training by Shaolin masters is a major tourist attraction. Award-winning infrastructure, world-class meeting venues, a 14,000 seat arena and a 5,000 seat theatre, many first-rate hotels etc has helped in promoting Lantau Island as a MICE destination. Lantau Island offers a splendid choice of famous Chinese cuisine such as Cantonese, Szechwan and Hunan as well as delicious western and Asian delicacies. Traditional delicacies like Yam Cha and Dim Sum are a must-try. Lantau Island is a place where you can sample the goodness of Thai, Indian, European and Japanese foods and beverages. Visit the food court in city gate outlet mall. Beautiful scenery, famous historical cites, monasteries, temples, beaches, manmade wonders in Disneyland, Ocean Park and Victoria Peak make Lantau Island one of the most attractive islands in Hong Kong. 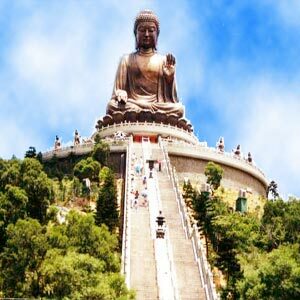 Tian Tan Big Buddha: The scenic cable car ride to NgonPing village to see Big Buddha is a top tourist attraction. The Buddha is approximately 10 minutes walk from the cable car station. There is so much to see along the way. Also, from atop the mountain you can enjoy a wonderful view of the many little islands, the flora and fauna that surround Lantau and the blue South China Sea. It is considered to be the world's largest, seated, outdoor Bronze Buddha. The Giant Buddha (34 meter or 112 feet. 220 tones) sits serenely atop (360 steps) Ngong Ping plateau amidst spectacular mountain scenery of Lantau Island. The image of Buddha is a symbol that helps visitors recall the qualities of Buddha. The statue is regarded to be most beautiful 'in the morning light, at precisely 8 o'clock'. It is a common sight to see visitors bowing to the deity or engage in sincere prayers. There is no entrance fee to walk up the stairs. Take a look at wooden bracelets that are sold near the Tian Tan Buddha statue. Feng Shui 5 elements theory recommends people who need wood element to wear wood bracelet. Further, wearing a Buddha mala wooden bracelet secures the wearer from bad elements and ushers in happiness. You can visit the three story exhibition hall which is at the base of the statute. There is a huge bell engraved with Buddhist figures and scriptures. Every seventh minute, the bell rings. In total, the bell rings 108 times in a day symbolizing relieving 108 vexations. Po Lin Monastery: Tian Tan Big Buddha is actually an extension of Po Lin Monastery which is located at 450 meters altitude on the Ngong Ping Plateau. There are 3 bronze statues of the Buddha depicting his past, present and future lives. There are many Buddhist scriptures too. A vegetarian meal is served in the Monastery. The culturally-themed Ngong Ping village is located nearby. Ngong Ping Village: In an area of 1.5 hectare, the buildings are architecturally designed to reflect and maintain the cultural and spiritual integrity of Ngong Ping area. Two attractions here include Walking with Buddha and the Monkey's Tale Theatre. Walking with Buddha is a multimedia presentation that allows visitors to follow the life of Buddha. The other one, Monkey's Tale theatre is a comical 'show' inspired by the famous Buddhist Jataka Stories. There is a lot of entertainment in the form of street performances, kung-fu demonstrations, Chinese acrobatic show and performance by jugglers. The path of wisdom: Close to Po Lin Monastery, a narrow pavement leads to the Path of Wisdom, an outdoor replica of the centuries-old Heart Sutra, the best known and most popular of all Buddhist scripture. The Sutra is displayed in wooden pillars placed in the form of infinity/infinite sign. Tai Wo: Tai Wo is a three centuries old fishing town located on the west coast of Lantau Island. Ferry services as well as regular bus services make exploring the village easy. The fishing village is lined with waterways, houses built on stilts over the sea, sampans exhibiting the rich timeless heritage. Shrimp paste is a famous local produce. You can even consider attending a shrimp paste-making session. There is a small village museum near the bus terminus, depicting the centuries old tools and erstwhile customs that were in vogue in the village. Shops in the village sell dried fish, fish products and tourist souvenirs. From the docks of Tai Wo, boats depart regularly to spot famous Chinese white dolphins in the waters of Pearl River mouth. Going offshore gets you to enjoy great views of Lantau. Mui Wo (Silvermine Bay): Mui Wo is a rural town on the eastern side of Lantau Island. It can be reached by ferry or by bus. During the 19th century, the silvermine cave was mined for silver. One abandoned silver mine still exists but is sealed for safety reasons. But tourists can see the 19th century watchtower that was built by the villagers to protect themselves from pirate attacks. Few historical sites including old temples and buildings, silvermine waterfall, numerous hiking trails are other attractions in the area. Silvermine beach is a popular swimming beach near Silvermine Bay. It is a flat beach with fine sand. Come summer, every year since 2006, Silvermine beach music festival attracts tourists from far and wide. Some of the best Hong Kong bands participate during the two-day beach party. Visitors are treated to an electrifying performance - an eclectic mix of rock and folk music. Cheung Sha Beach: Cheung Sha beach is the longest beach on Lantau Island. It is located on the south coast of Lantau Island. The beach is split in two by a small headland, the upper beach and the lower beach. The secluded upper beach is best to get close to the sea. 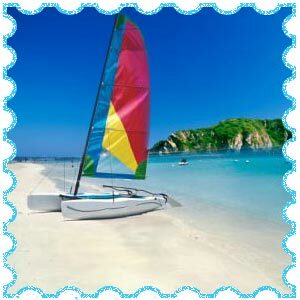 The flat water and soothing wind favors anyone wanting to practice windsurfing skills. The lower beach has amenities like changing rooms, showers, BBQ area and restaurants. Certain trekking routes around the beach area require prior permission from the Leisure and cultural Services Department. Tong Fuk Beach: Beyond Cheung Sha Upper beach is the other popular beach, the Tong Fuk Beach. The view from the beach that of inland wooded slopes, the hills is truly fascinating. To enjoy the beauty in its entirety, tourists rent village houses and spend a day/night. Tung Chung fort: A historical and archeological site in Lantau Island, this is a must-visit site for history buffs. It is near the airport, walking distance from city gate shopping center. The fort was built to protect the place against the invading Europeans. From the carvings on the fort, the date of architecture is estimated to be around 1832. It is recognized as a national heritage site and houses the public primary school of Tung Chung. Visitors are allowed on all days except Tuesday. There isn't any entry fee. The attractive features of the site include the antique museum, solid cement bases, granite blocks on which 6 cannons with muzzle-loading facilities are placed. The cannons are huge; the length is almost 70 - 80 meters. Disneyland theme park in Lantau: Located in Penny's Bay, the theme park is modeled after the original in California, USA. The amusement park consists of four themed lands similar to those found in the other 4 Disneyland parks around the world. This is the largest one among the other parks. As you step in, a magical world unfurls. Meeting favorite characters like Mickey Mouse and Donald Duck becomes reality. Other attractions include futuristic mountains, jungle elephants, bears that can talk, hissing snakes and space age rockets. First-time visitors are usually keen on visiting places of tourist interests. The Lantau Island hiking tours led by volunteers are for those who are eager to discover the peace and serenity of Lantau Island through nature walks. 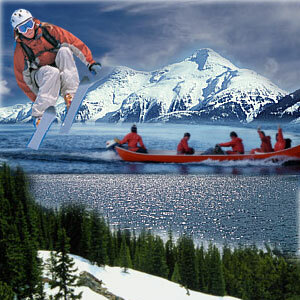 There are two hiking trails, the 40 km and the shorter 25 km hike, full-day hikes or half-day hikes. Full-day hikes take you to more remote areas. Hiking up the hills can leave you tired, visiting the Big Buddha can kindle spirituality, nature walks may inspire to explore more and more of Lantau, so it's only natural to feel an urge to plan another trip to Lantau Island soon. First Published Date: 8 Nov 2011 Last modified Date: April 22 2019 This page may have been updated recently as new information is available or the content may have been edited for better readability.